1951 Topps is significant to my History of Joakim Soria project for a couple reasons. First, it is the very first year Topps put out a card… there is no 1950 Topps. They weren’t exactly the as other Topps years either. They had rounded corners and were shorter than the regular 3.5 inch baseball card that would soon become common. It had different baseball results so they could be played like a card game. I chose “Ball” for Joakim Soria because it was one of the first cards I found to use for a template. 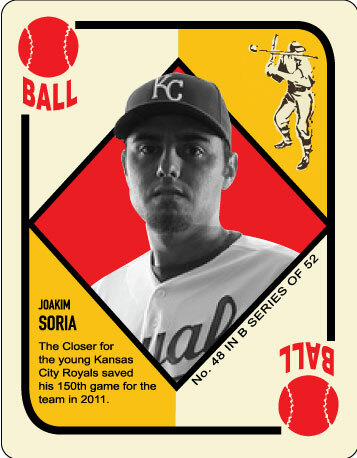 Secondly, it is the LAST History of Joakim Soria card. My last post was 2012 Topps and soon after I got the motivation to finish off my complete set! I’m pretty excited about it. I spent about a year and a half (off and on of course) re-creating the Topps cards and have finally finished all 61 years. I think it may be a set like no other. I will continue to post these throughout the season as I still have several left to put up on the site. I think you did a great job with this project, it was real fun following it. Do you plan on doing something similar with different player (s)? Thanks, It was a lot of fun. I have to post about 35 more Soria cards on this project I think. I have them made but not posted yet. I would like to do this with other players, I don’t know exactly what I would do but I’m sure I’ll expand on it somehow.